For some inexplicable reason, I had a strong ‘nesting instinct’ during my pregnancy with Oliver. 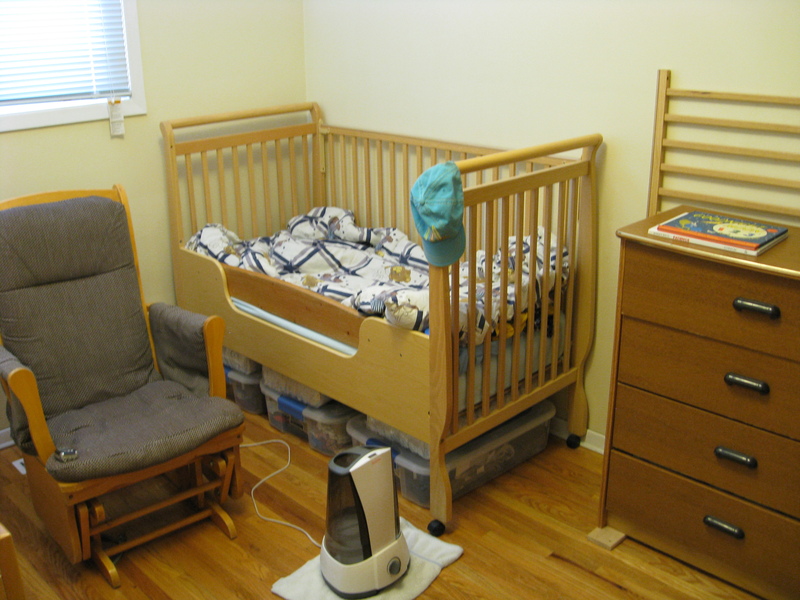 Perhaps it was because I was feeling more energetic this pregnancy than the last two, or perhaps it was because I had finally settled on a plan as to which room would be the baby’s room for the foreseeable long-term future. Whatever the case may be, I was eager to make more preparations for this little one than I had been able to for Justin and Patrick. 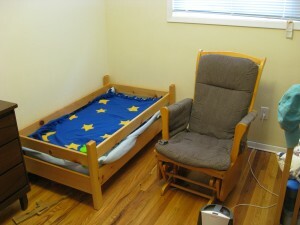 The boys were staying there, and yes, the room was cluttered. 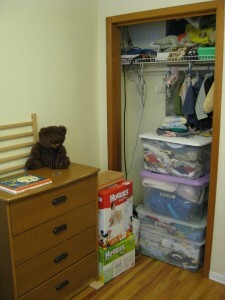 The closet didn’t have a door, and it was a real eyesore. Boxes of diapers piled up in corners because I didn’t have any other place to store them. And just previous to these pictures being taken, I had gotten rid of a not-so-attractive white change table which didn’t match any of the other furniture. I switched to using a change pad on top of a dresser, which is a real space saver in such a small room. First, we made a loft/bunk bed for Justin and moved the boys into another room, along with their furniture. With the boys’ furniture out of the way, I got the basics in place: crib, dresser, and glider chair. I really wanted to make a curtain to hide the clutter in the closet, so I went to Fabricland looking for a cute fabric suitable for a baby’s room. I was intending to purchase a safari animal print with little lions and monkeys and the like, and there was a good selection of such to be had, but I soon discovered it would cost me about $15 to $20 per meter on average! I quickly had the store employee usher me to the on-sale fabrics’ table. After picking through those rolls of fabric for some time, I finally settled on a dark green one which I thought would be decent enough for my project, bought five meters of it for $15 total, picked up some spools of thread and left. Once home, however, the wheels of creativity began to turn. 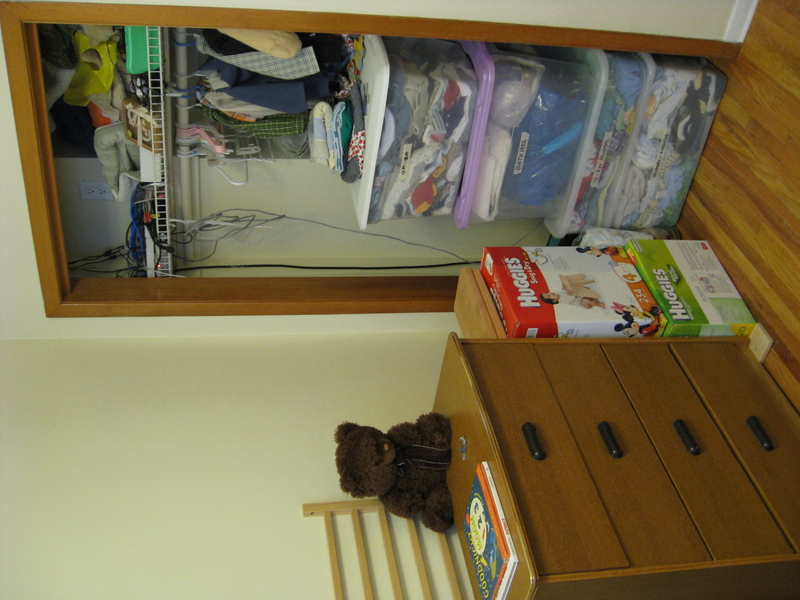 I realized that if I scaled down a little on the width of the closet curtain, I would have enough remaining fabric to make other items for the baby’s room. I then went through my fabric scraps and pulled out a light green bed skirt I had been given but which didn’t fit our bed. The two fabrics seemed complementary, and so I ran with it. First I made the closet curtain as I intended using the fabric I had purchased. I then made a pleated crib skirt out of the bed skirt material, with recessed panels of the dark green fabric. 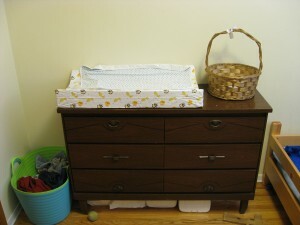 The crib skirt would serve to hide the packages of diapers out of sight under the crib. Lastly, to add some frill to the window, I made a simple window valance out of the bed skirt material, with a trim of the dark green fabric. This entry was posted on Wednesday, June 19th, 2013 at 9:08 am	and is filed under Around the House. You can follow any responses to this entry through the RSS 2.0 feed. Both comments and pings are currently closed.